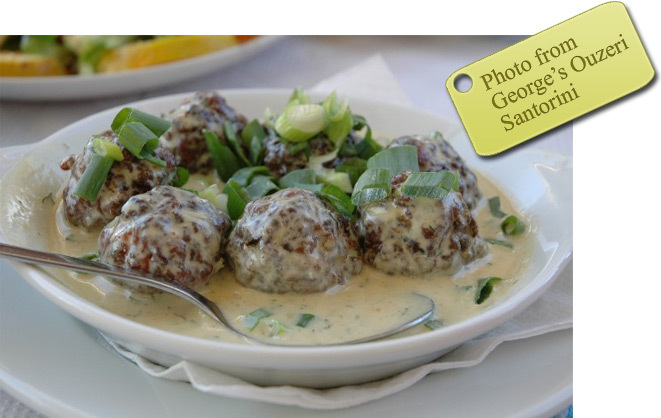 Greek people like meatballs too much and for that reason there are many meat ball recipes. One of the tastiest is meat balls with ouzo, relatively easy to prepare. In a large bowl place the minced chicken, the parsley, the dill, the oregano, the onions and the eggs. Add salt and pepper and mix well. Mould mixture and shape it into small balls. Heat oil in a frying pan. Coat each ball and fry until brown. In a saucepan place the cream, salt and pepper and boil. Add the ouzo, mix and boil again. Add the meatballs and let boil for 5 minutes. Remove from heat and serve hot.